Hello! Sorry for the 4 week delay in updating but the new baby came slightly earlier than planned! 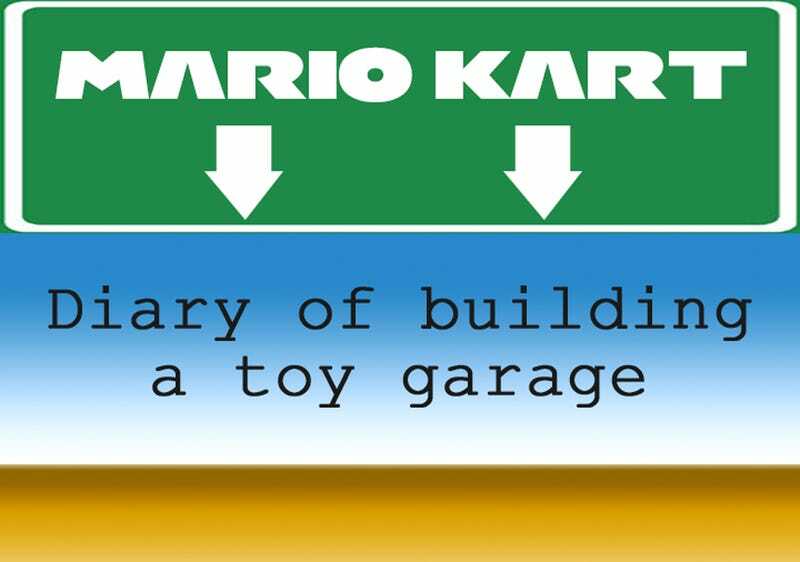 Chester’s now has a little brother called Ralph to share his (unbuilt) Mario Kart Garage with. Ralph was born on October 17th and mother and baby are doing really well. As you can imagine I’ve not had a huge amount of time to spend on the Garage but that’s doesn’t mean I haven’t done anything – in fact I’m getting dangerously close to finishing cutting and drilling all of the pieces for the final build. One of the main parts I’ve been working on is the half tyres that will make up the border around the lower floor of the garage. I mentioned in my last post that this needed a major rethink and I can confirm that my idea of using thinner ply wood and sticking it together has worked a treat. Above: what I was aiming for. Below: the final result! In fact the result has exceeded all expectations – the pieces have come out with small ridges in that look a bit like tyre grip so they are even better than I imagined. I think it’s a side effect of using ply wood as the MDF was always had a smooth finish when I cut it. For reference I used a 52mm hole-saw and the tyres have come out at around 48mm diameter with a 25mm hole drilled in the centre. I then chopped these in half to create the ‘half buried’ tyre look. I’ve also worked on the petrol pumps using the same principle of layers of ply wood stuck together. I initially cut the pieces with a jig-saw then stuck them together – shaping them with a file and sandpaper afterwards. These are now ready to be painted and to have the graphics stuck on. The other work that’s been done is on the main structure – you can see in the image below that I’ve added some batons on the back and side pieces, this is so I can screw the base and the first level to them. I was thinking about just gluing but decided it wouldn’t be strong enough. The batons will pull the pieces together as well and correct some slight warping in the wood. I haven’t cut the ramp properly yet – I’m waiting until I’ve actual screwed the rest of the structure together then I’m going to cut it to size. This way can get a really snug fit that should hopefully hide the joins and make it seamless. Altogether I’m very pleased with how it’s looking – the image below shows it stuck together with tape to give an idea of the finished piece. I’m really happy with the size, the placement of the pumps, the ramp and the height of the first floor. I want Chester to be able to get his hands underneath the first floor – that’s why I’ve made it quite high. Not shown in the image are the small discs that have been cut - these will be at the top and bottom of the pillars. The pillars will slide into these then be glued and screwed in to the lower and first floors. These are for added strength but also to hide the untidy tops of the pillars – I didn’t cut them very straight and they have little gaps at the edges! Oops! My plan for the next week is to steam-bend the wood to go on the front of the first level! To be honest I’m pretty nervous about it as I’ve never steam-bent wood before. Wish me luck and I’ll be back with an update asap.